The Rheumatology Day Unit at University Hospital of Wales has received a £1000 donation from the fundraising efforts of a patient’s daughter. Charlotte Hill who lives in North Wales wanted to say thank you to the Rheumatology Day Unit for the support and care they have given to her mum Andrea since 2005 and decided to run the Snowdon trail half marathon to raise funds. 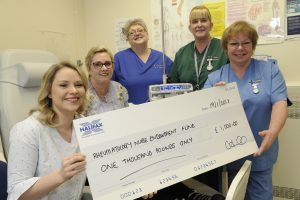 Charlotte wanted to raise money for the Unit to provide comfort and enhance patient’s experience when attending the Rheumatology Day Unit which provides a range of treatments to patients with Rheumatological conditions in the form of intravenous and subcutaneous therapies. Charlotte said “I know that with their support and care they make my mother’s annual ‘antifreeze’ treatment a lot more bearable. The staff at the unit have become more like friends to my mother and always go the extra mile to make what can be a very difficult day a lot more joyful. “I knew the run was not going to be easy as it entailed summiting Snowdon via the Rangers track and coming down the Llanberis route with a 5km hill at the end just to finish the legs off. Andrea, who first attended the unit in 2005 for systemic sclerosis, said “When I was first referred to the Day Unit I had never had an infusion and only had bloods taken in clinic so the words ‘iloprost, infusion, venflon and saline flush’ were all new to me and quite frankly a little scary. However after ten minutes of speaking with Glenys and Anne-Marie all my questions and concerns were answered. “This can be a very long tiring week consisting of five six hour long infusions especially when the veins you’re counting on decide that they really do not want to play ball. During these difficult days all the team give support and guidance. My veins are never a problem to them as they have all the solutions to ensure that there is more than one vein they can use and they will find it this is always done with compassion, empathy and humour. This makes my visit bearable. The Rheumatology Department is based at the University Hospital of Wales and offers both outpatient and inpatient services. With over 200 types of arthritis and rheumatic diseases, the department offers a comprehensive diagnostic and treatment service. Specialist clinics are run for patients with connective tissue disease, ankylosing spondylitis, drug monitoring and children with arthritis. Treatment with the ‘new biologic’ drugs (anti-TNF) are carried out in the day unit. As well as the day unit for drug infusion the team offers patients training for self injection, a telephone advice line for patients who need advice about medication and disease flares for all forms of inflammatory joint disease.